Fourth Row Center: Film Writings by Jason Bailey: On DVD: "Arizona Dream"
There’s a word for a movie like Arizona Dream: inexplicable. I’m a reasonably intelligent college graduate, and I can’t make heads or tails out of the goddamn thing. A gun to my head, I couldn’t explain the strange Eskimo opening, or the Russian roulette scene, or the flying ambulance, or all the stuff with the flying fish. I have no idea why they spend so much screen time with the main characters blindfolded and searching for a piñata in a windstorm. 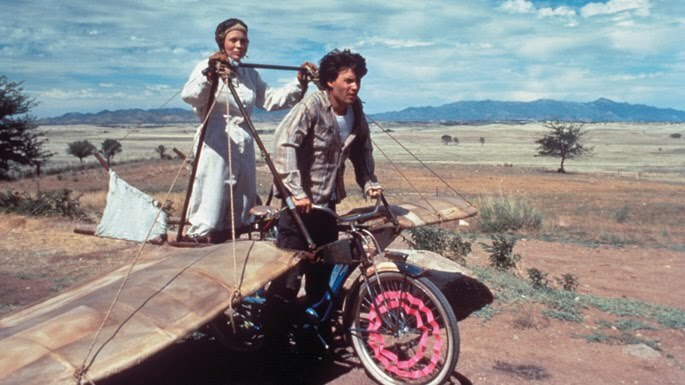 And for the life of me, I can’t comprehend the scene where Johnny Depp wheels around the house acting like a chicken, clucking along while Lili Taylor plays the accordion. I can’t explain any of this stuff, because there is no plausible explanation for it. The movie is weird for weird’s sake. Emir Kusturica co-wrote and directed it, and I’ll bet he doesn’t know what the hell’s going on in it either. This is customarily the point in the review where one summarizes the plot; it hardly matters here, but I’ll soldier on as if nothing is wrong. Depp plays Axel Blackmar, a reasonably happy fish tagger in New York who is brought back to his home in Arizona by his cousin Paul (Vincent Gallo), so that he can serve as the best man for his uncle Leo (Jerry Lewis), a car salesman. Leo wants Axel to join him and Paul in the family business. “No matter how much I loved the smell of cheap cologne,” Axel says in voice-over, “I was never gonna be like my uncle. I was never gonna sell Cadillacs.” Two minutes later, he’s selling Cadillacs. In waltzes Elaine Stalker (Faye Dunaway) and her stepdaughter Grace (Lili Taylor); Axel is immediately smitten, and he and Paul end up at the Stalkers’ home for dinner. This dinner scene is the first sign that the movie is about to fall right off the rails. It shouldn’t—hell, I’d plunk down twenty bucks to buy a documentary of Johnny Depp, Vincent Gallo, Faye Dunaway, and Lili Taylor having dinner. But Kusturica has a turtle crawling across the table, Gallo singing songs from The Wizard of Oz, a suicide attempt, and various levels of destruction, and the timing is so far off, it’s befuddling. It’s as if an alien civilization tried to make a screwball comedy. It’s all pretty much down the tubes from there, as we degenerate into a weird love triangle and countless scenes of Depp and Dunaway in a variety of flying machines that crash and fold like outtakes from Gizmo!. There are, in all fairness, some clever sight gags—most of them throwaway bits, like Depp and Gallo rolling around in a background fistfight throughout one of Lewis and Dunaway’s dialogue scenes. But most of the time, we stare at the screen, slack-jawed; how did this many talented people get talked into appearing in this? How did Warner Brothers get swindled into putting up $19 million to make it? Of the performers, Lewis comes off best; he’s mostly working in his semi-serious King of Comedy style, and he manages to turn in a skilled performance of quiet authority (though Kusturica leaves in a couple of instances of unfortunate and disposable mugging). Depp and Dunaway have to follow the wild mood swings of the script; they put on their best game faces, but what the hell can they do with this kind of material? Even Lewis drowns in the ultra-serious ambulance scene (there’s nothing worse than absurdity turned maudlin), and everyone else seems absolutely lost with the artfully self-important ending, which tries to make some semblance of sense out of what’s come before with some easy symbolism and a wrap-up voice-over. Nice try. Little of it makes any sense, though a scene or two, here or there, works as a stand-alone entity. But there’s no cause and effect, no follow-through; nothing is related to much of anything else. Other scenes have potential but are botched by the poor execution. In one scene, would-be actor Paul goes to an amateur night to impersonate Cary Grant in the crop-duster scene of North by Northwest--it’s an odd but clever notion, spoiled by Kusturica’s decision to intercut shots from the original scene. Later, it appears that the climax will consist of us watching Vincent Gallo watching Godfather II. Both scenes only cause us to wish that we were watching those films rather than this one. It took a lot of smart people to make Arizona Dream, and I can’t imagine any of them thought the film was actually entertaining or enlightening. The best I can put together is that the purposeful intention was to confuse and confound the audience. If that’s the case, then the picture is a huge success. "Arizona Dream" is now available on DVD through the Warner Archive program. For full A/V details, read this review at DVD Talk.